The legalization of recreational cannabis in Canada on October 17, 2018, has heightened the focus on issues regarding impairment in the workplace. Being impaired at work – whether caused by alcohol, drugs, or another source – can affect our ability to focus, make decisions, follow instructions, and handle equipment and tools. Employers and supervisors should know how to recognize impairment, address concerns, refer to appropriate help or supports, and evaluate the need for accommodation. 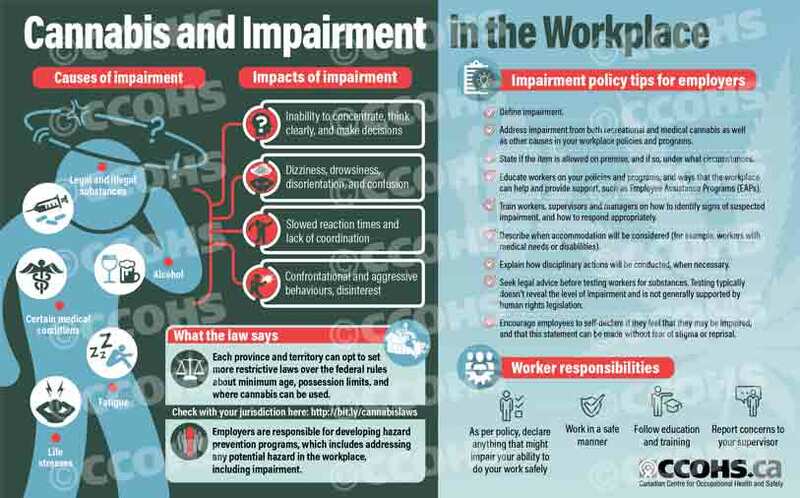 Share this card that outlines the effects of impairment, what the law says, and the key elements of an impairment policy. These information cards are printed double-sided, with English on one side and French on the other, on sturdy card stock with a UV coating for added durability. Note that a minimum order of 10 cards is required. We also offer an infographic for sharing online.